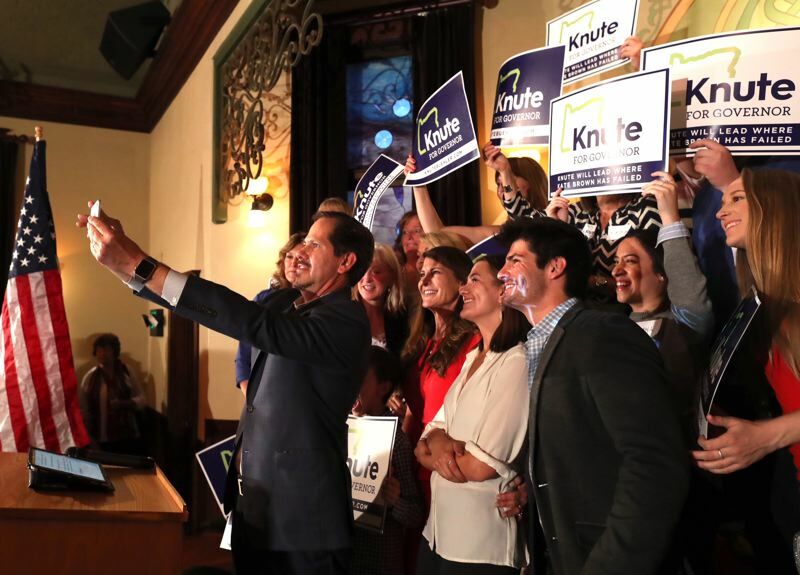 Rep. Knute Buehler, the GOP nominee for governor, challenges opponent Gov. Kate Brown to changing the focus of the special session May 21 toward child protection. About 12 hours after winning the GOP nomination for governor, Rep. Knute Buehler called on lawmakers to consider emergency legislation to boost oversight of teacher misconduct as part of their special session later this month. Buehler's proposal would prohibit provisions in teacher contracts that allow the destruction of personnel documents related to complaints and investigations when a teacher moves to a new job. The Bend lawmakers said the fix is a higher priority than Gov. Kate Brown's intention for the special session to expand tax breaks to small businesses, a move that Buehler characterized as political posturing. "I would always choose keeping kids safe over tax reform, especially corporate tax reform designed to be political theater for Kate Brown's reelection campaign," Buehler said in a phone interview Wednesday with the Pamplin/EO Capital Bureau. Brown "supports the conversation," said Bryan Hockaday, a press secretary on her office. "But, at the request of Republican house leadership, she has committed to keeping the special session focused on reducing taxes for small businesses."? Buehler said he wants to prevent incidents similar to those involving Mitch Whitehurst. Portland Public Schools retained the teacher and coach for 30 years despite multiple complaints against him of sexual misconduct against students. A 322-page audit concerning the district's failures in addressing the problems recommended that Portland Public Schools discontinue the practice of separation agreements that include gag orders that prevent disclosure of conduct. Brown, a Democrat who is seeking her second and final term as governor, called a special session for May 21 to expand state tax breaks to sole proprietors. They were excluded from breaks given in 2013 to owners of other types of businesses, such as S-corporations and partnerships, in which business income is taxed at the owner's personal rate rather than higher corporate rates. The move was meant to console business owners after Brown signed Senate Bill 1528 into law last month. The new law prevented them from claiming a new 20 percent deduction, provided in federal tax reform, on their state tax returns. Oregon automatically conforms to federal tax code unless state lawmakers pass legislation specifically to modify it. Brown said the special session would "stop this unfairness" created in the 2013 state tax reform. "It's imperative that the Legislature take action now so that many more Oregon small businesses can take advantage of this economic incentive," Brown said May 9. Education is expected to take the forefront in the campaign for the governor's office. The issue is one that resonates with both Republicans and the Democrats, Independents and nonaffiliated voters, whom Buehler would need to win the Governor's Office in the Democratic-majority state. Buehler has said if elected governor, he would hold off on signing any bills until lawmakers reached agreement on reforming the state's public pension system to free up more money for education. He also is a proponent of school choice and more dual credit opportunities for high school pupils. Brown's campaign spokesman, Christian Gaston, said she has "a well-articulated vision for our education system in Oregon." "She's made targeted investments improving graduation rates by 4.7 percent and is focused on expanding hands-on learning opportunities through Future Ready Oregon."